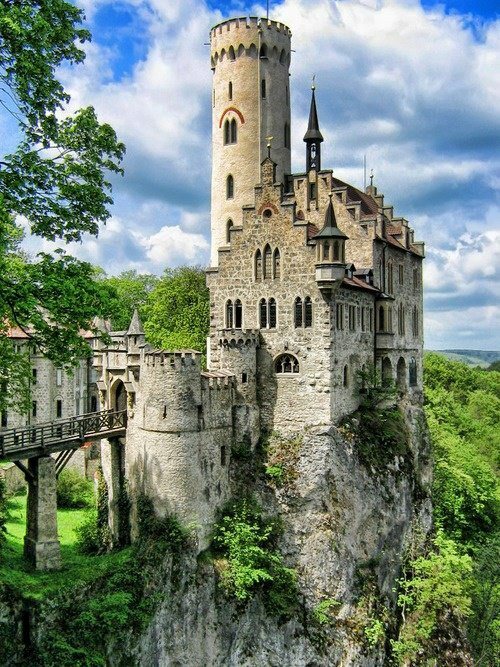 Lichtenstein Castle is situated on a cliff located near Honau on the Swabian Alb, Baden-Württemberg, Germany. Historically, there has been a castle on the site since around 1200. It was twice destroyed, once in the Reichskrieg's War of 1311 and again by the city-state of Reutlingen in 1381. The castle was not reconstructed and subsequently fell to ruin. In 1802, the land came into the hands of King Frederick I of Württemberg, who built a hunting lodge there. By 1837, the land had passed to his nephew Duke Wilhelm of Urach, Count of Württemberg, who, inspired by Wilhelm Hauff's novelLichtenstein, added the current castle in 1840–42. The romantic Neo-Gothic design of the castle was created by the architect Carl Alexander Heideloff. Today, the castle is still owned by the Dukes of Urach, but is open to visitors. The castle contains a large collection of historic weapons and armour.